Motorbike powered race cars played a large part in Australian Motor Sport after WW2 not only in Road Racing but also Hill Climbs & Sprints. Much is known about the Coopers that ran in their day but what is known of the others that competed during this period, John Medley covers quite a few in his Bathurst Book but there are many more that ran. The elite of the Motorbike powered cars for me are the two cars ran by the late Jack Myers, but again this is only 2 cars of many, there was a open wheeler running at Oran Park in the 1970's with motorbike power that was still at the sharp end of the field. What are your memories of this cars. There was even the attempt to get a 'Formula 4' category going, which led to there being some little cars with later model (later sixties, that is...) Japanese bike power units. I think they were 250s, and wasn't Brian Morrow involved? Ralts, of course, went that way, as well as the Bob Joass Jolus creations. Hillclimbs were the place to see motorbike-engined cars. Bill Hinte built a car called 'Jabenti', and worked hard to get the Formula 4 thing going. I know it is not quite the same but the Aussie Racing Cars are bike powered, as was the Legends before them. I have seen some bike powered very modern Sports Cars recently too.The name escapes me ATM. There is still several older [historic these days] bike powered open wheelers at hillclimbs. Speaking of karts, Alan Strachan did the commentary at King Edward Park for some years; he was stationed at the bowling club. On one occasion someone ran the first kart seen on that hill; each time that it appeared in Alan's view rounding the Bogey Hole he would cry "It's a man on wheels!". I highly recommend 'Loose Fillings' if you have an interest in the subject. Many of the locally built Australian and NZ cars are now much better known than they were even 5 years ago. I don't remember the outcome. A good subject for a caption competition; "What Is This Man Saying?". Mike Cotton of Newcastle had a Cooper, Mk IX as I recall. I think I saw it once at King Edward Park; I'm not certain and may be wrong. Mike Cotton had a car sales business at Broadmeadow; I don't think that he has been mentioned in the "Australian drivers who owned or worked in car sales businesses" topic. Edited by plannerpower, 04 October 2011 - 09:06. Edited by lyntonh, 12 February 2012 - 10:54. Wonderful pics of The -Running-Jumping-And-Standing-Still-Show, gents! The Maxoan ( =Mac's Own) had bodywork of lithographic plates, print to the inside perhaps so Rod could read the Women's Weekly while hillclimbing. It probably still holds distance records for Tiny Little Sports Cars. When Frank Cuttell drove it at an Historic Amaroo, he clutch-started it down the entry slope and as it scuttled through the marshalling grid my then small children shrieked in unison "It looks like a dung beetle!!" Love the front mounting point for the trailing arm on the Lawson Ballantyne car! What was the 350 DKW, Greg Mackie? Didn't Maurie Miller have some sort of motorcycle powered MJM before the MJM RoadRunnerVee? Some wonderful photos turning up here. John, the 'Deek' [that's what I called it] was even smaller than the 'Voodoo', as I transported it in my 6' X 4' box trailer. I built it close to kart specs., and used a 350 DKW two-stroke twin for power, via a chain to the solid rear axle. To keep the scrutineers sort of happy, as 4 wheel brakes were compulsory, I used Sturmey Archer push-bike brakes on the front - operated by cables. The rear brake was a disc on the rear axle. Later on I replaced the DKW engine [not a lot of power], with a 500 Triumph Tiger 100 donk [about 30 hp, and enough to scare the daylights out of me]. Jim Robson bought the Deek [for not much] for Mark to 'play with' at Silverdale..........after I put the DKW engine back in! No idea where it is - Jim may know? Best result was FTD ar Amaroo, on 25th June, 1967. [25.45]. Edit: Just realised that the 'Deek' enabled me to snag one of my most prized 'goodies'..........a Silverdale 'Under 40' badge! Edited by GMACKIE, 04 October 2011 - 08:29. Some Speedway midgets had bike engines, at least one did anyway cause I remember as a kid helping to pushstart it! (and I clearly remember Norton on the cases and John Walker was the driver). Edited by cheapracer, 04 October 2011 - 06:08. What about Ronnie Ward.......his 'hybrid' twins were something else! From memory, he'd use a Harley crank-case, Norton heads, and various other odd-and-ends, to produce an engine capable of beating the top cars. Was it Johnny Stewart who drove that little car so well? Or Bruce Peters? C'mon you Speedway lot, help me! Edited by GMACKIE, 04 October 2011 - 21:33. I was thinking that we shouldn't forget the less-pur sang areas of motor racing when considering 'bike-engined cars. "TQ" racing on dirt tracks was very popular in the Newcastle/Coalfields area where I mis-spent my youth. I have some photos somewhere I think; I will look. Just put some castor oil in the incense burner while listening. Knowing "Uncle" Lawson we could not print it here !!!! I don't remember Lawson ever bending the car. Lawson is well into his ninety's and still going strong - must be that whisky he hides in the shed ! During the 60's at Huckson Diecasting Pty Ltd at Botany we had my dad as manageing director, Lawson Ballantyne as chief engineer and his "Venom" , myself building Austin Specials - Proton - and keeping the Rennmax going, John and Glynn Ballantyne with Austin and Renault specials and later formula vee's. There was a constant stream of visitors - Ray Winter, Damon Beck, Peter Finlay, John Wright (K Mac), Clive Osborne, Tom Sulman, Peter Cohen. Tony McAlpine would tell us tall tales of riding Vincent HRD's at the Isle of Man - etc, etc. I was uncertain of the spelling of "Ballantyne"; I like to get things correct so I googled for Lawson Ballantine/Ballantyne and got both variants. I decided to adopt the CAMS version ("Ballantine"); I have edited my post to substitute the "y" that you both used. A lovely bloke, as was Betty; well, Bett wasn't a bloke but you know what I mean. I'm delighted to hear that he is still with us. John; Rod McCallum was a great bloke; a Peugeot enthusiast. He showed me and our mutual friend the "easy" way to mate a grey Holden motor to a Peugeot gearbox. I remember a Motorbike powered car running at Oran Park in the 1960 driven by a guy with the surname of Tracey, do not know if he is a relative of mine or not but if anyone knows about the car & driver I would appriciate the information. The names that have been submitted of past drivers & cars is mindblowing let alone the photos, keep them comming. The Berkeley 105, with the Royal Enfield 700 engine, was a sports car, but at least two of them,that I remember, were raced in Australia, in the early '60s. A chap by the name of Wilson, and Paul Samuels [the Berkeley importer]. Paul had a 'monumental' roll-over at W. Farm in his. A friend of mine John Lewin was racing his MGA TC in that race & was the first car on the scene, stopped & helped Paul until Officals arrived, he worked at Wollongong Hospital so had a idear of what was required in an emeergancy. If I remember correctly was it not on the Western Crossing & the car was Pauls second Berkeley. I'm no authority but this looks like a JW4. .....Rod McCallum was a great bloke; a Peugeot enthusiast. And he was ready to show me! I carried his name and phone number in my wallet for a multitude of years in case I ever got around to needing to do this. He had a 203 with a grey Holden engine in it, I went to see him once but never went any further with that 'dream'... I think the plan was to use this mix in a Simca body for a Sports Sedan or something like that. I must be getting on now, I can't remember what all my schemes and plans were all about! R Barnard’s Ariel Special. I assume from the name that it was Ariel powered. I well remember my brother competing at the Camperdown hillclimb and we stayed with farmer Judd (Ian) who was later to win the AHCC in a Cheetah Oldsmobile, oustide of town. Too young to drive I was consigned to passenger seat in my brothers Wolseley 6/110 and with Ian Speight following in his Wolseley 6/90 and into camperdown for a counter meal we went. On the long straight into town the 6/90 proved marginally faster than the 6/110 much to my brothers dismay. After a long dinner, home in the dark we went. At about 90 mph on the long straight Greg decided that he didn't like Ian drafting him so he turned off his lights and we continued, lucky it was moonlit night! There were two 90 degree bends just prior the Judd's farm and a braking duel developed and 6/110 discs won. Stopping to open the gates into the farm I could see the front drums on the 6/90 glowing cherry red. Lucky grog did not affect them! The next morning Ian wondered why the brakes on the 6/90 were not working so well. I remember this like yesterday but can't remember who was faster in the hilclimb. The Cann BSA is another to add to the list. I understand it went to NSW in the early 70's and was re-engined and known as the Cann Honda. Where is it now? I believe the JGS is still in Vic but unable to be pried from the hands of its long time owner. Edited by Shane Bowden, 06 October 2011 - 05:43. I was wondering about the Cann Honda. I think that the Cann Vincent (pictured in my initial post) was re-engined with a blown VW; I didn't know if the Cann Honda was an iteration of this car or whether it was a different car. It seems from Shane's post that it was a different car. Great story about the Wolseleys; as an aficionado of old monochrome British film/television crime series I have a particular love for the Wolseleys of that era. John Davies (the Newcastle one) had a Kawasaki-engined hillclimb car; I spent some time pushing it around various hillclimb paddocks in the 1970s. Dennis Russell had it afterwards; a bit of Googling shows that he still had it in 2006 as he ran at round 5 of the NSW Hillclimb Championship in that year. We appear to have few/ no Victorians here on TNF... but can any recall Bill Balle's "Ball of Fire" which I recall seeing race very effectively at Winton in the early 1970s? Unless, of course, the 6/90 had overdrive and the 6/110 was automatic. In which case, shame on your brother for sinking so low. As for plannerpower's love of these cars, I can tell you from personal experience that this love will wear thin in the case of the latter models. They were faster and stopped better, probably handled better, but required a new front end every 9,000 miles! The 6/110 was an auto & the 6/90 a manual. Was it the Cann VW that Ian Wells hillclimbed? Was this the former Vincent -powered car? If so, a Cann VW story: I still own the trailer that car then used. Hard-driven and chased through Southern Queensland by a hard-driven Peugeot the Cann VW towcar with Cann VW on trailer heading to some Queensland hillclimb was finally caught by the perspiring Peugeot driver who then shouted out " I have been trying to tell you you lost your trailer back door 20 miles back"
Thanks to all for your input but it surprises me that no one has mentioned Jack Brabrahm who ran his Speedway car at Hill Climbs. The most alarming thing is that very few are wearing seat belts of any kind, very brave drivers as the speed over the finish at Huntley was very near 100MPH. Anyway here is a collection of photo's from the 1960's, Huntley Hill Climb & Nowra Hill Climb. Thanks John for the info on Owen Tracey, are there any photo's available of his car. The Triumph powered car in which Jack lost his life at Catalina Park, Huntley Pits, who remembers the modified sewing machine that Jack used as a Lathe to modify his SU & Amal needles. The DPR Truimph, Huntley Pits, Jeff Davinson???? Yes and yes; that's my understanding. The Cann VW was indeed the updated Cann Vincent that was subsequently owned by Ian Wells. I thought the car was then sold to NSW and always wondered if this then morphed into the Wortmeyer SCV which appeared about this time? Ray Cann lived in the same suburb as we did (Reservoir) and my brother often took me to Ray's house & business - the "Ray Cann Carrying Company". Ray's fleet of vehicles comprised VW Kombis in varying states of decrepitness which provided a ready source of engines for the Cann VW. Ray was instrumental in urging my brother to purchase the Cann BSA from Kurt Seeburg and get into motor sport. Kurt was rechristened by us after he subsequently crashed his Brabham Bt36 at Hume Weir as Kurt Treeburg. I do recall Bill Balle's car, not as a 500 but Vincent powered. At Phillip Island 1971 my brother had progressed to 1100 F3 with a Datsun powered Lotus 20b and was comprehensivley blown away by Bill who if I recall correctly qualified on the front row in what was a supposedly out dated air cooled device! A very impressive performance. Bill ran a windscreen business in Lillydale and in the mid 70's the car was mounted on the office wall. Where is it now? Speaking of Vincent powered cars I recall going to Warrandyte to get gears for Greg's Hewland gearbox from Peter Holinger when he worked from home. This was when he was fitting the Repco to to the hillclimb car and the Vincent was on the bench. I admired the Vincent and was promptly advised that there was not much Vincent left other than the cases and the rest was Holinger! Great pics, DanTra2858. You should send these to "Loose Fillings": see Garry Simkin's address previously noted. The DPR Triumph was built by Geoff Davidson, Bruce Powell and Charlie Rofe --- hence DPR --- farmers all from various rural locations. If we note the right rear Lukey alloy wheel of the DPR in the pic of "Bruce Powell's Special pits Huntley 1960" there were TWO cars. What was the wonderfully gormless # 45 ( never knew about this one)? The Cann VW was indeed the updated Cann Vincent that was subsequently owned by Ian Wells. I thought the car was then sold to NSW and always wondered if this then morphed into the Wortmeyer SCV which appeared about this time? other than, perhaps, the Cann car providing the inspiration. If VWs can be included, what of the wonderfully named Lobo Jones, still in Dale Riddiford's ownership up on Mt Panorama? While the Tammell has been mentioned, its near-relative the Alba (still I believe in the hands of Alan Morton ) has not. Does that account for the Selby brothers cars? All the SCV cars were built by Jack Wortmeyer, with design HELP from Spike Jones, Ken Davies & Erol Richardson, Spike is driving the gold painted chassie car in it's early form. The Wortmeyer SCV, to the best of my knowledge, was built by Erol Richardson. Maybe he can bring people up to date on this car. The one pictured looks like it has Spike Jones driving. I didn't intend to take this topic OT with my photo of the SCV; I was just replying to Shane's comment that he had ... always wondered if (the Cann VW) ... morphed into the Wortmeyer SCV...". Dan (the OP) did ask about motorcycle-engined cars and what a wealth of fascinating information has emerged! I trust that a great deal more will be added to this topic. I hoped someone might have put a name to this by now.....even if it's not on topic!! The more I look at that photo, the more I think it may be Bill Hinte, in his own creation, the Jabenti. I had a go in post #24; I said I'm no authority but this looks like a JW4. The exhaust looks very "two-stroke"; if, as you say, it's ... not on topic ... it must not be a motor-cycle engine. Not sure if Bill is still around.....if he is, I'm sure he could settle this. A few Tasmanian motorcycle-engined cars. The Walkem was built by Jock Walkem in Launceston about 1954-55 with Manx Norton engine and later re-engined with Vincent twin but this photo at Penguin Hillclimb circa 1956 puzzles me a bit because it appears to show neither. Next one with Vincent, also at Penguin but a year or two later. A.Harvey, 5 Day Special, Baskerville 1959. I think this car and at least 2 other air-cooleds were built specifically for the 1959 Australian Hillclimb Championship at Hobart's Domain, which was twinned with a Baskervelle meeting next day. 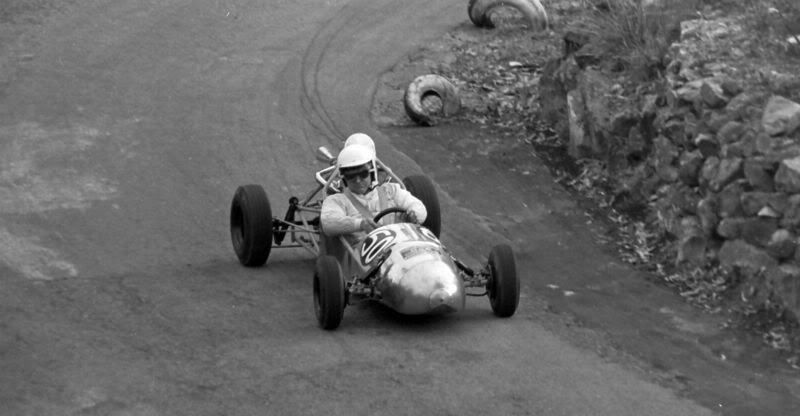 Unknown car and driver, believed to be Muddy Creek Hillclimb, Tamar Valley, mid 1950s. Does anyone recognise the chassis rails? Thanks for the info gents, I've always liked the photo. It looks like the car's got some real grunt the way his head's laying back! I thought it was a bike engine from looking at the exhausts, that's why I posted it. Now for that chainsaw motor....I've got an old 2 cubic inch Poulan here that takes twenty pulls to start. Maybe there's hope for it yet!! Edited by lyntonh, 08 October 2011 - 03:49.